© Kosuke Fujishima • ExD• Bandai Visual /D.G.A. Plot Summary: When Lisa, Lorna and Souichi enter an eX-Driver Race set in America. 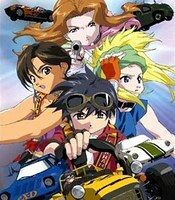 They Rescue a young girl and become involved in a plot that may involve the eX-Driver progarm itself.